At Montreal Kanreikai Karate, we designed classes that meet the needs of our students according to their age or belt level. Each student can therefore select classes from one of the following categories using our class schedule. 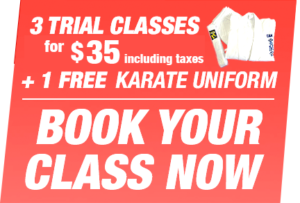 We are proud to offer varied and motivating classes that meet the needs of our students and guide them in their journey within the Kanreikai Karate family. Thanks to our Initiation to Karate program, kids aged 4 to 6 discover this martial art through exercises adapted for their age and games. Our Beginner Level classes are aimed to White Belts and Blue Belts. They represent the start of a fascinating and rewarding journey that will contribute to the physical and mental development of every student. Our Intermediate Level classes are designed for students ranked Yellow Tip to Green Tip. These classes consolidate their technical knowledge and offer them new challenges. Our students ranked Green Belt to Black Belt attend advanced level classes. These classes require a solid commitment and continued efforts from the students.